Brett Shaffer -- Event #31 Champion! Brett Shaffer just won his second World Series of Poker bracelet in Event #31: $1,500 No-Limit Hold'em, and he defeated RJ Sullivan heads up to claim the first-place prize of $418,435. 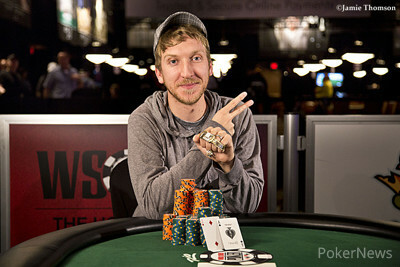 Shaffer won his first bracelet in a $1,500 no-limit holdem event at last year’s WSOP. The total amount of entries in this event reached 1,631, creating a prize pool of $2,201,850. The field was quite a bit smaller than last year when Jason Duval took it down, earning $521,202 by defeating a field of 2,115. On the last hand of tonight's final table, Sullivan raised to 180,000 from the button and Shaffer pushed all in. Sullivan made the call, putting himself at risk. Sullivan got it in with a bit of an advantage, but his lead melted on the flop of . His rail started calling for a three, but he didn't find any help on the turn or river. Shaffer won the hand with trip deuces and Sullivan was eliminated from the tournament in second place. Day 3 began with 15 hopefuls vying for WSOP gold. It took less than two levels of play to reach the final table, and Steven McNally became the final table bubble boy after just a few hands of 10-handed play. Sullivan raised it up to 50,000 from middle position and McNally took a minute before pushing his stack all in from the big blind. Sullivan made the call with the bigger stack and McNally's tournament was at risk, though he was way ahead preflop. McNally was safe and looking to double on the flop of as well as the turn of the , and his rail was excitedly anticipating his big double. But then, Sullivan spiked the on the river and McNally's supporters erupted with a loud, "Ooohhh!" 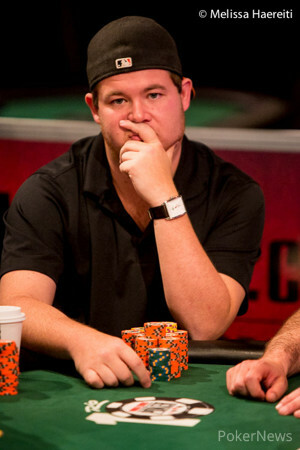 McNally was eliminated in 10th place and earned $23,317 for his run. The final table was headlined by seasoned pro Matt Stout, who took the chip lead into the final day of play. Stout busted in third place when his four-bet shove was called by Sullivan. Stout opened to 135,000 and Sullivan raised to 290,000. Stout moved all in and Sullivan called, putting Stout’s tournament life on the line. Stout was favored before the flop and was looking to score the double up, but then the dealer fanned out a board of ; Sullivan paired his queen and it stood strong. Stout earned $170,247 for his effort. Other eliminations from the final table included Peter Gould, who was eliminated in fourth place ($122,731), Aleksandr Gofman in fifth place ($89,835), Robert Schmidt in sixth place ($66,176), Rob Wazwaz in seventh place ($50,246), Jim Jakobsen in eighth place ($38,365), and Jason Vanstrom Finished in ninth place ($29,658). Notables making the money but falling short of the final table spotlight were Eric Mizrachi, Jackie Glazier, Adam Levy, Nenad Medic, Vinny Pahuja, Erik Cajelais, Lauren Kling, and Ray Qartomy. Thank you for following along with PokerNews and stay tuned for all the action of the 45th annual World Series of Poker. 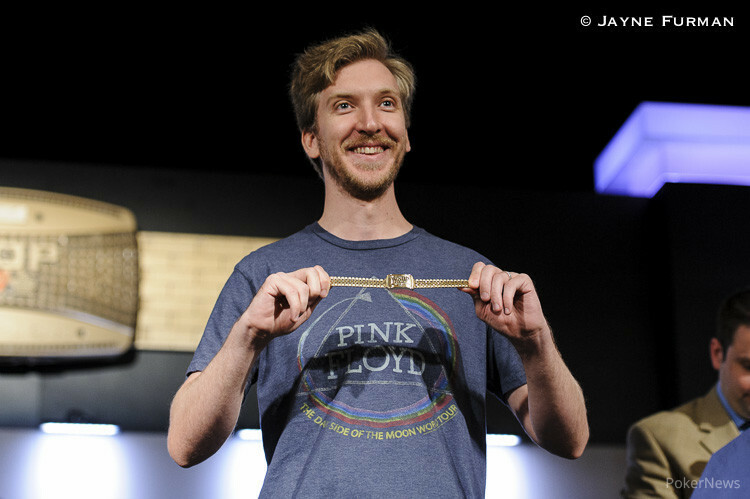 Congratulations once again to Brett Shaffer, the WSOP’s latest bracelet winner. Hand #145: RJ Sullivan raised to 160,000 and Brett Shaffer called. The flop came and Shaffer led out for 175,000. Sullivan let go of his hand and Shaffer won the pot. Hand #146: Shaffer raised to 190,000 and Sullivan called. The dealer spread out for a flop and Sullivan checked. Shaffer checked as well and the turn came down as . Sullivan slid out a bet of 175,000 and Shaffer spent a minute deciding to raise to 400,000. Sullivan made the call and we went to the river of . Sullivan checked and Shaffer announced a bet of 800,000. Sullivan made the call. Shaffer showed for a straight and Sullivan mucked his hand. Hand #147: Sullivan raised to 180,000 from the button and Shaffer pushed all in. Sullivan made the call. Sullivan got it in with a bit of an advantage, but his lead melted on the flop of . His rail started calling for a three, but he didn't find any help on the turn or river of . Shaffer won the hand with trip twos and Sullivan was eliminated from the tournament in second place. He will collect $258,695 for his runner-up finish. Hand #140: RJ Sullivan opened to 160,000, Brett Shaffer three-bet to 400,000, Sullivan four-bet to 950,000, and Shaffer laid it down. Hand #141 Shaffer opened to 190,000, and Sullivan folded. Hand #142: Sullivan opened to 160,000, Shaffer three-bet to 525,000, and Sullivan folded. Hand #143: Shaffer opened to 190,000, and Sullivan folded. Hand #144: Shaffer got a walk. Hand #136: Brett Shaffer got a walk. Hand #137: RJ Sullivan got a walk. Hand #138: Sullivan raised to 160,000 with the button and Shaffer three-bet to 400,000. Sullivan four-bet to 950,000 and won the pot preflop. Hand #139: Sullivan got a walk. We are going on a 20-minute break. Hand #135: Brett Shaffer raised to 130,000 and RJ Sullivan three-bet to 290,000 in the big blind. Shaffer made the call and the flop came down . Sullivan led out for 185,000 and won the hand. With just one hand of heads-up play finished, the time has run out on the clock in Level 28.